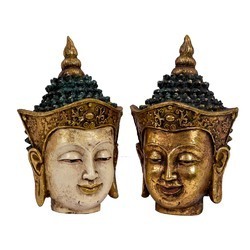 We are Exporter, Manufacturer and Wholesaler of FRP Artefacts. We unfurl our splendid range of FRP Artifacts that are designed in accordance with the needs and wants of our clients. We believe in customer satisfaction. We majorily supply in India, USA, Australia, Dubai, Malasiya, UK, France, Europe etc. 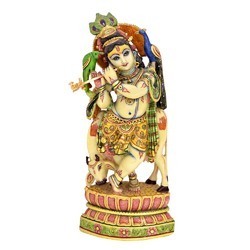 We offer FRP Marble Krishna Moorti with fine gold artistic work. 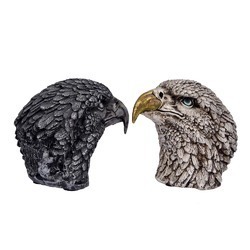 This statue size is 9" height. There are Cow and Peacock with this Krishna idol,which is making it unique moorti. The flute is detachable with this idol. There is OM carved on the back side of this beautiful murti. We offer FRP Radha Krishna Idol with fine gold artistic work. It is 15" height. 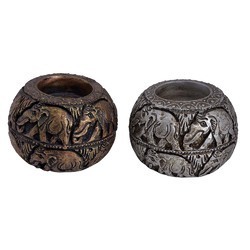 There is very fine carving which makes it very beautiful and attractive. 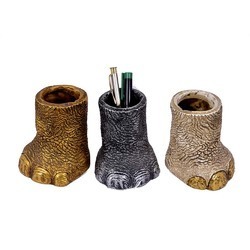 We are one of the noted suppliers of a variety of FRP Pen Holder. 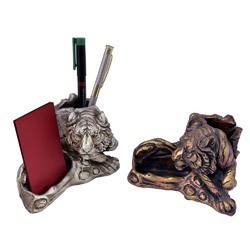 We keep in mind the over growing requirements of our clients while manufacturing and supplying Pen Holder of different types, beautiful patterns and unique designs. Under our leading team of manufacturers, exporter and suppliers, we are able to make FRP Products. These come with excellent durability and will provide the users with longer working life. 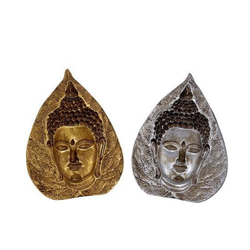 FRP Buddha Face on detachable Lotus base & with fixed Lotus base also. We unfurl our splendid range of FRP Artifacts that are designed in accordance with the needs and wants of our clients. 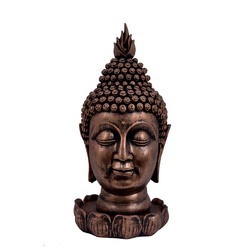 Under our leading team of manufacturers, exporter and suppliers, we are able to make Standing Buddha. These come with excellent durability and will provide the users with longer working life. 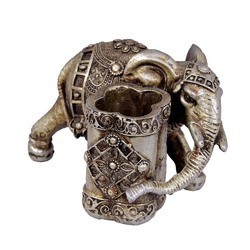 Under our leading team of manufacturers, exporter and suppliers, we are able to make FRP T-Light Holder that is well decorated with various artistic products. These come with excellent durability and will provide the users with longer working life. These can be placed anywhere according to the need of the customers. These are available in different shapes, sizes and designs match up the growing demand of the users. Well known manufacturer, supplier & exporter of FRP Krishna Moorti. 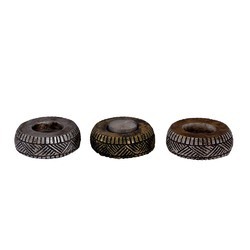 We manufacture these products by using the high grade of raw material. These can be placed anywhere according to the need of the customers. These are available in different shapes, sizes and designs to match up the growing demand of the users. These are procured from reliable vendors who are well known in this field. 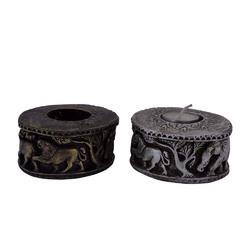 We offer 12" FRP GANESHA sitting on Lotus. 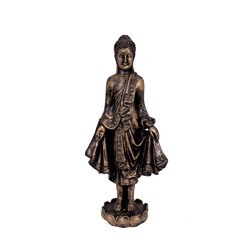 This statue is made with fine gold artistic work. 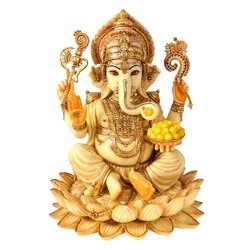 This Ganesha statue can be kept in your house and office for worship as it is vital to get blessings of lord Ganesha. 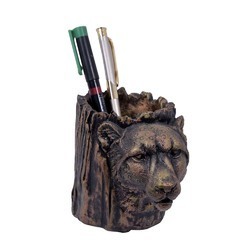 It is fine carved on both the side. Packaging Details: We pack it in special foam export packing, which is fully safe in courier. 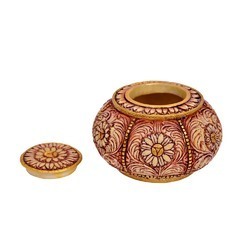 This FRP bowl is made up of antique pattern which is beauty of this bowl. We mfg.Resin products also. 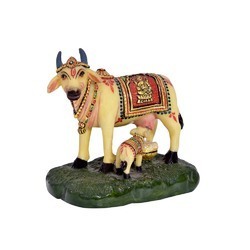 It is 'Cow with Calf' made with resin in fine finish. Godess Lakshmi ji and lord Ganesha portrait has been made upon this beautiful artilce with gold art work. This small and cute Calf is making this artefact more attractive. 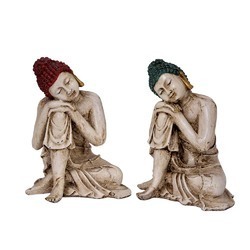 It is to be kept at your prayer place / temple for worship.